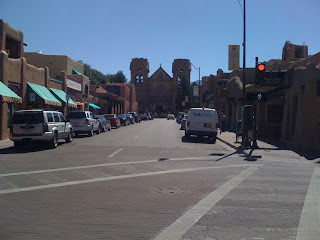 I arrived in NM a couple of days ago, and found myself driving back to Santa Fe yesterday morning. At 11:00 a.m., I took these two photos from the plaza area downtown. One, the St. Francis Church. 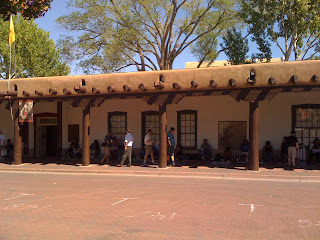 The other, the native Americans who sell their jewelry under the portal at the Palace of the Governors. What's wrong with these photos? There's hardly anyone around. 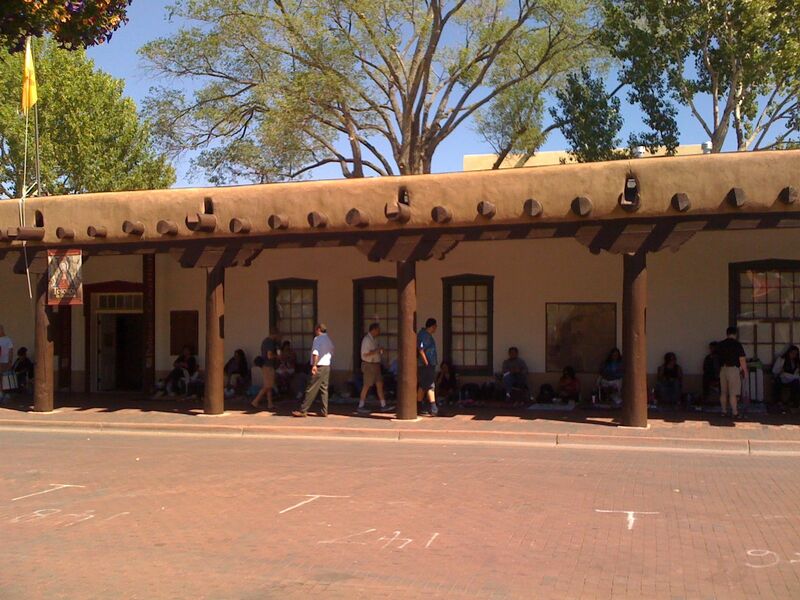 Even though it's the week after the big Indian Market, it is still summer and I have never seen the plaza in Santa Fe so devoid of tourists at this time of the year. This is what I would expect to see later in October, or early November. A sad picture(s), to be sure. More evidence as to why Taos is suffering from the lack of tourists...I'm sure glad I closed the shop when I did. I have shopped at this very spot. It was right after shopping in this area and gawking at the lovely church, that we drove to Maria's and ate some of the best Mexican food we have ever had and drank fab margaritas. Al Lucero, who owns Maria's Restaurant, has the most wonderful margarita cookbook. Oh how I long to be in NM......smelling the smells, eating the foods and drinking the tequila. Me thinks you shoulda gone to Maria's. I'm so glad to have you back home. This little square is where I bought my pinon burner and pinon. One of my other favorite things I bought in NM. Ah Martie......you bring back the best memories. And yes, this is the worst I have ever seen our economy. It is so sad. Ter'e: What great memories you have from these photos. We had actually had breakfast at Tia Sophia's (a long time favorite), so no room for more food at Maria's on this trip. Will get there eventually, I promise. They are still selling the bushel bags of chiles at the market in town, and yesterday, while we were there, I got to smell them as the roasters were going right outside the store. Bliss! Honey I hate to see pictures like this and it is very sad. I have always loved New Mexico and the last time I was there was my daughter and I went to Taos in Feb maybe two years ago. No probably 3 isn't that horrible I can't remember which Feb. There was a yarn place there that I will never forget because you just don't see them around here. Just wish our economy would pick back up. I know you are so glad not to have a shop now.